The Pine Nut Mtns are a 40-mile N-S range in Western Nevada separating Carson Valley to the west from Smith Valley to the east. Mt. Siegel is the highpoint of the range, a summit I visited years earlier as my finisher for the OGUL list. Today I was here with Sean and Asaka to tackle Mt. Como, another high summit in the range and a P1K. We had arrived at this choice by way of the Trinity Alps where I had first thought of heading this weekend. An unusual June weather system was heading across Northern California and though weak, as a fair-weather hiker I avoid such happenings if I can. So we settled on Mt. 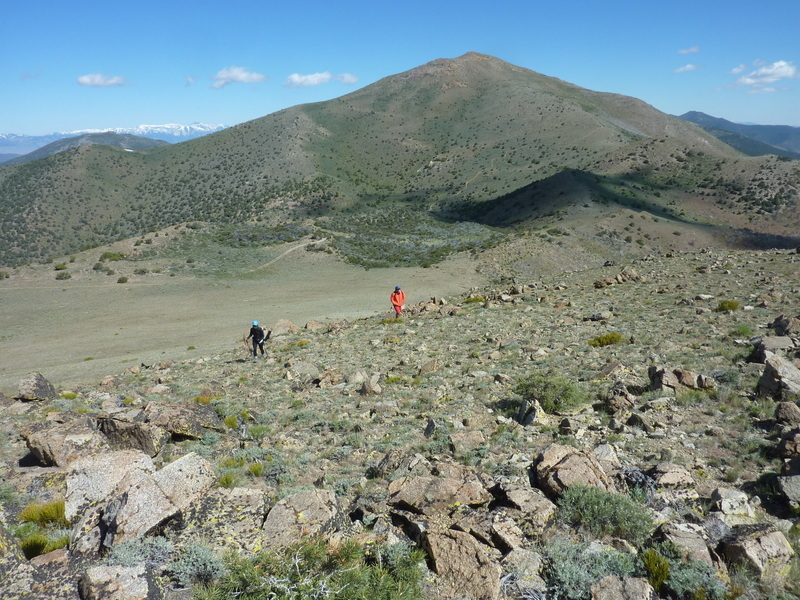 Como and a P2K north of Yerington for our main goals, with some other P1Ks and convenient bonus peaks thrown into the mix. These two summits are located almost dead center in the range, accessible from the west or east side. Older trip reports describe a confusing array of dirt roads that seemed to comprise the crux of the outing. With the advent of Google Maps, satellite views and GPS, such navigational challenges are easily dispensed with. We picked out a route from the east starting from Wellington at SR208 and Upper Colony Rd, a longish drive, but half of it paved and all but the last mile on good dirt roads. Sean's Jeep Grand Cherokee made the drive go much faster than it would have been in my van. It had been windy the previous day and night and would continue without letup all day today. This would make for some gale force winds at the crest and keep us bundled in extra clothing despite the workout. We drove to 6,000ft, less than 2mi due west of Mt. Como. Starting out around 7:45a, our plan was fairly simple - hike southwest to the crest, tag Rice, head north to Como, then drop straight down to the Jeep. There are no cliffs, heavy brush or other serious obstacles in this part of the range, allowing the peaks to be climbed by almost any route one chooses. The first 2/3mi was a gentle rise over grassy slopes, brown and gone to seed over the past month. This made for an unusual desert range problem, one more often found in the Coast Ranges - annoying stickers in the shoes and socks. My long pants protected my socks quite nicely, but the others were not so equipped and would have to stop within the first hour to remove the vast collection they'd acquired in that time. The grass and stickers continued for about 2/3 of the distance up the slopes before finally relenting. A fire had burned over much of the mountain slopes here in the past 5-10yrs, destroying most of the pinyon and junipers that once covered a good deal of the slopes. This helped with the proliferation of the grasses (which would probably have been a lovely green a few months earlier) but otherwise made for easy, open travel. One section of the ridge we climbed was covered in a maze of burned junipers which made for a minor challenge to weave our way through - it must have been a good deal harder before the fire, we guessed. Once at the crest, now covered only in low scrub, we were greeted by the strong wind blowing over the range from the west. We added clothing as we headed south, about 2mi towards Rice Peak. There is a great view west from the crest to the snowy Sierra around the Lake Tahoe area, from Monument Peak and the Heavenly Ski Area north to Mt. Rose. The Carson Valley stretches the distance in-between, the source of the only cell coverage I'd have all day. Where practical, we'd hike just below the east side of the crest or up shallow ravines somewhat protected by subsidary ridgelines west of the main crest. We reached the 8,972-foot summit of Rice Peak by 10:30a. Locating a poorly-protected register (only had one of the usual two tin cans), we immediately ducked off the east side to get out of the brunt of the wind. Before we had reached the summit, Sean had been convinced that the true summit was 1/3mi to the southeast at another point. Looking at it from where we sat, it looked to be of similar height and worth considering. The wind made it impossible for me to hold my hand level still, rendering that method inconclusive. I decided to pay the other point a visit while Sean and Asaka snacked, giving them a sign (my waving arms) to join me if for some reason I was to conclude it was higher. After a short walk and another use of the hand level, it seemed clear that the original point was highest. The most telling factor was that I could see that via line-of-sight it was at, or higher than the 10,000ft Mt. Rose in the background. The one advantage of the lower point was that it had a better view looking south to Mt. Siegel and Oreana. After returning to the highpoint, we collected our gear and started back north to Mt. Como. There was more dodging of the wind as we made the various ups and down along the ridgeline. Back near where we had first reached the crest on the ascent, we picked up a jeep road that climbs up from the west side of the range. One of the Rice register entries had been a dirt biker who had used this road and cross-country travel to ride all the way to the summit. One fork of the road goes high up the south side of Mt. Como. I followed this road for about a mile while Sean and Asaka followed the ridgeline more closely. Their route proved far superior as I found myself well behind them and playing catch-up as we climbed the last 1,000ft to Como's summit. Asaka and I ended up reaching the summit at nearly the same time, Sean lagging some as he found himself about five minutes behind us. Once again the strong winds drove us from the summit to the leeward side for shelter from the gale force. I spent some time looking for a register amongst the summit rocks but came up empty. Perhaps there was one hidden in the many rocks found there, but the search was somewhat frenetic as I had trouble standing up and could hardly keep my balance. There were steel wires and other debris from a survey tower that I tripped up on more than once in my search. While we lunched just below the summit rocks, I pulled out a register from my pack to leave on the summit in a more obvious cairn before we left. We took in the views we had from our perch, stretching east across the Great Basin and much of West-Central Nevada. We spent more than half an hour at the summit, or rather just below it, before packing up our stuff and starting down. The descent would be fairly quick, taking just over an hour to drop 3,000ft in something less than two miles. We descended grassy slopes, slipping regularly on the flattened stalks and weaving through burned sections along the ridgeline in a mostly direct route from the summit down to the waiting Jeep. Well ahead of the others, I paused periodically to take pictures of some of the flowers we passed and wait for them to catch up. The strength of the wind decreased as we lost altitude and it was somewhat warm by the time we returned after 2:15p. With lots of daylight remaining, we discussed options for another hike. One possibility was to continue the long drive up to Sunrise Pass and then climb Lyon Peak from there. An easier option that we eventually settled on was to climb Artesia BM, another P1K less than 4mi east from where we were parked. Unfortunately, there were no roads getting near the peak from the west side so it was necessary to do some 14mi of driving, taking us an hour and a half. On the plus side, none of us were against just exploring about in the Jeep, especially after we'd done a long hike already. Sean commented that Asaka has probably seen more of the American West in her three years here than most residents have seen in a lifetime. Given the amount of miles he's put on the Jeep in those three years, about 100,000, I'd bet he was right.